Fig species which is native to South and South-East Asia. 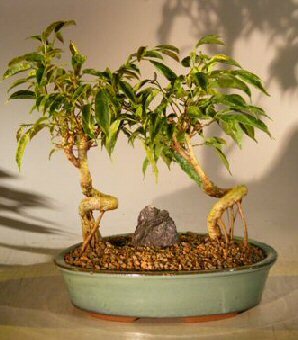 This evergreen tree is particularly good for bonsai training as they produce sturdy trunks, good branching charachteristics and shiny leaves. Best to trim in early spring/summer as the new leaves that subsequently grow will be smaller than the ones removed. Ours is trained in the coiled trunk style with banyan roots. Great for indoors year-round, the brighter the location, the more compact the growth. Each is 6 years old, 12" tall.